Goal-directed actions are sensitive to work-related response costs, and dopamine in nucleus accumbens is thought to modulate the exertion of effort in motivated behavior. Dopamine-rich striatal areas such as nucleus accumbens also contain high numbers of adenosine A2A receptors, and, for that reason, the behavioral and neurochemical effects of the adenosine A2A receptor agonist CGS 21680 [2-p-(2-carboxyethyl) phenethylamino-5′-N-ethylcarboxamidoadenosine] were investigated. Stimulation of accumbens adenosine A2A receptors disrupted performance of an instrumental task with high work demands (i.e., an interval lever-pressing schedule with a ratio requirement attached) but had little effect on a task with a lower work requirement. Immunohistochemical studies revealed that accumbens neurons that project to the ventral pallidum showed adenosine A2A receptors immunoreactivity. Moreover, activation of accumbens A2A receptors by local injections of CGS 21680 increased extracellular GABA levels in the ventral pallidum. Combined contralateral injections of CGS 21680 into the accumbens and the GABAA agonist muscimol into ventral pallidum (i.e., “disconnection” methods) also impaired response output, indicating that these structures are part of a common neural circuitry regulating the exertion of effort. Thus, accumbens adenosine A2A receptors appear to regulate behavioral activation and effort-related processes by modulating the activity of the ventral striatopallidal pathway. Research on the effort-related functions of these forebrain systems may lead to a greater understanding of pathological features of motivation, such as psychomotor slowing, anergia, and fatigue in depression. Striatal function is modulated by several neurotransmitters, including amino acids, dopamine (DA), acetylcholine (Surmeier, 2006), and the purine nucleoside adenosine (Fredholm and Svenningsson, 2003; Fuxe et al., 2007; Schiffmann et al., 2007; Ferré, 2008). Adenosine acts on G-protein-coupled receptors, and the A2A receptor subtype is highly concentrated in neostriatum and nucleus accumbens (Rosin et al., 1998; Svenningsson et al., 1999; Hettinger et al., 2001). There is an interaction between striatal A2A receptors and DA D2 receptors, and adenosine A2A receptor blockade can antagonize motor deficits induced DA depletions or antagonism (Correa et al., 2004; Morelli et al., 2007; Salamone et al., 2008). Adenosine A2A antagonists are being assessed for antiparkinsonian effects in clinical trials (Schwarzschild et al., 2006; Morelli et al., 2007), and A2A receptors contribute to the stimulant effects of nonselective adenosine antagonists such as caffeine (Ferré, 2008). Stimulation of neostriatal adenosine A2A receptors induces motor effects that resemble those of DA antagonists (Wardas et al., 2003), but less is known about the role of accumbens A2A receptors (Hauber and Munkle, 1997; Ishiwari et al., 2007). Nucleus accumbens DA modulates the performance of goal-directed behaviors and is involved in various aspects of instrumental learning and motivation (Ikemoto and Panksepp, 1996; Salamone and Correa, 2002; Kelley, 2004; Barbano and Cador, 2007; Berridge, 2007; Robbins and Everitt, 2007; Salamone et al., 2007). An important function of accumbens DA is the modulation of behavioral activation and effort-related processes. Accumbens DA is particularly important for tasks that require substantial effort to obtain the goal (Salamone et al., 2002, 2005, 2007). Accumbens DA depletions alter effort-related choice (Salamone et al., 1991, 2007) and disrupt operant responding substantially in schedules with high effort demands (Aberman and Salamone, 1999; Salamone et al., 2001). One way of varying effort demands in operant tasks is to control the ratio requirement (i.e., number of lever presses needed to receive reinforcement). Whereas fixed ratio 1 (FR1) performance is resistant to the effects of accumbens DA depletions, tasks with higher ratio requirements (e.g., FR5–FR64) are more easily disrupted (Aberman and Salamone, 1999). This effect occurs even if one controls for the amount of time between reinforcements; DA depletions disrupted lever pressing when a FR5 or FR10 requirement was attached to variable time intervals of 30, 60, or 120 s but not when an FR1 was attached (Correa et al., 2002; Mingote et al., 2005). In the present experiments, we investigated whether the adenosine A2A agonist CGS 21680 [2-p-(2-carboxyethyl) phenethylamino-5′-N-ethylcarboxamidoadenosine] would also interact with the ratio requirement by differentially affecting performance on time-controlled schedules (variable interval, 60 s) with two different requirements (FR1 vs FR10) (Mingote et al., 2005). It was hypothesized that accumbens A2A receptor stimulation would produce effects similar to accumbens DA depletions. The accumbens core subregion was studied because, compared with the shell, this region is richer in adenosine A2A receptor immunoreactivity (Rosin et al. 1998) and is more sensitive to the locomotor effects of A2A antagonists (Ishiwari et al. 2007). Furthermore, we studied the anatomy, neurochemistry, and behavioral significance of GABAergic ventral striatopallidal neurons, which project from nucleus accumbens to ventral pallidum (VP) and are hypothesized to contain adenosine A2A receptors (Robertson and Jian, 1995; Ferré, 1997). VP is thought to function as a relay area and an integrator of striatal and limbic inputs (Hooks and Kalivas, 1995; Kretschmer, 2000; Tindell et al., 2004; Farrar et al., 2008). We determined the effects of intra-accumbens injections of CGS 21680 on GABA release in VP and used “disconnection” methods to study the combined and separate effects of accumbens adenosine A2A receptor stimulation and GABAA receptor stimulation in the contralateral VP. Male Sprague Dawley rats (290–350 g; Harlan Sprague Dawley) were maintained at 23°C with a 12 h light/dark cycle. Behavioral testing occurred during the light part of cycle (9:00 A.M. to 6:00 P.M.). Except during postoperative recovery, rats were food restricted to 12–14 g/d. Water was available ad libitum in the home cages. Animals were housed in pairs before surgery and singly afterward, and different groups of animals were used for each experiment. Experimental methods were in accordance with the Guide for the Care and Use of Laboratory Animals, National Research Council. Behavioral experiments were conducted in operant chambers (30 × 24 × 21 cm; Med Associates), and 45 mg Bioserve Pellets were used as reinforcers. Animals were trained for 30 min sessions 5 d/week during the light part of the light/dark cycle for 5 weeks before surgery and 4 weeks after surgery. After 1 week of FR1 training, rats were trained on one of two schedules of reinforcement for 5 weeks: a variable interval (VI) 60 s schedule with a FR1 requirement attached to the interval requirement (VI60/FR1) or a VI 60 s schedule with FR10 attached (VI60/FR10) as described previously (Mingote et al., 2005). For the VI60/FR1 schedule, rats were reinforced for the first response after each variable interval elapsed. Rats on VI60/FR10 schedule were required to make 10 responses after each interval elapsed to receive reinforcement. In both cases, the particular interval varied around an average time requirement of 60 s; this limited the programmed density of reinforcement to a maximum of 30 pellets per session. Behavioral measures during the acquisition and testing phase of all behavioral studies included number of food pellets obtained, number of lever presses, and inter-response times (IRTs) (i.e., time between the onset of two consecutive responses). IRTs were assigned to 1 s bins, and the following time bins were recorded: bin 1, 0–1 s; bin 2, 1–2 s; bin 3, 2–3 s; bin 4, 3–4 s; bin 5, 4–5 s; bin 6, 5–6 s; bin 7, 6–7 s; bin 8, 7–8 s; bin 9, 8–9 s; bin 10, 9–10 s; bin 11, 10–11 s; bin 12, 11–12 s; bin 13, 12–13 s; bin 14, 13–14 s; bin 15, 14–15 s; bin 16, 15–16 s; bin 17, 16–17 s; bin 18, 17–18 s; bin 19, 18–19 s; bin 20, 19–20 s; and bin 21, > 20 s. The last IRT bin was designated as a pause. Before surgery, animals were anesthetized with a ketamine/xylazine solution (1.0 ml/kg, i.p. ; 10 ml of 100 mg/ml ketamine plus 0.75 ml of 20 mg/ml xylazine). Guide cannulas made with 25 gauge extra-thin-walled stainless steel tubing (Small Parts) were implanted 1.0 mm dorsal the target site. The following coordinates were used for accumbens placements: 2.8 mm anterior from bregma, 1.8 mm lateral from the midline, 6.8–7.0 mm ventral from the skull surface; the incisor bar was set 5.0 mm above the interaural line. The VP coordinates were as follows: 0.8 mm anterior from bregma, 2.6 mm lateral from midline, and 7.0 mm ventral from skull surface; the incisor bar was set between −3.2 and −4 mm below the interaural line. In the microdialysis experiment, rats received unilateral implantations of a 10 mm microdialysis guide cannula (Bioanalytical Systems) at the same coordinates used for cannulas implants, except that the dorsal/ventral coordinates were adjusted to −6.8 mm to allow for the size of the probe. Cannulas were secured to the skull by stainless steel screws and polycarboxylate cement (Durelon; 3M ESPE Dental Products); a stylet was inserted through each cannula to ensure its integrity. CGS 21680 was obtained from Tocris Cookson. This drug was used because it has been used as a ligand for striatal adenosine A2A receptors for several years (Jarvis et al., 1989; Cunha et al., 1996). CGS 21680 binding in nucleus accumbens is abolished in adenosine A2A receptor knock-out mice but not in A1 receptor knock-out mice (Halldner et al. 2004). For systemic injections, the drug was dissolved in 2% dimethylsulfoxide solution (Fisher Scientific), and this solution served as the vehicle control. For intracranial injections, CGS 21680 was dissolved in 0.9% saline. Muscimol hydrochloride was obtained from Sigma-Aldrich and dissolved in saline for intracranial injections. In all behavioral experiments, intracranial injections were made via 30 gauge stainless steel injectors extending 1.0 mm beyond the guide cannulas. Injectors were attached to 10 μl Hamilton syringes by polyethylene PE-10 tubing. Injection volume was 0.5 μl/side (0.125 μl/min for 4 min). Injectors were left in place for 1 min after the infusion to allow for drug diffusion. Effects of systemic injections of CGS 21680 on operant responding. Trained rats received intraperitoneal injections of CGS 21680 (vehicle, 0.05, 0.1, and 0.2 mg/kg; VI60/FR1, n = 12; VI60/FR10, n = 12). Injections were given 15 min before the 30 min session began. Each rat received all drug treatments in a randomly varied order (one treatment per week; within-groups design). Baseline training sessions were conducted 4 additional days per week. Effects of intra-accumbens injections of CGS 21680 on operant responding. Additional groups of trained rats were surgically implanted with bilateral accumbens cannulas. After recovery (7–10 d), rats were trained for 2 additional weeks on their presurgery schedules. On the test day, animals received bilateral intracranial injections of CGS 21680 and were immediately placed in the operant boxes and tested for 30 min. Each animal received one of the following doses of CGS 21680 (dissolved in saline vehicle): saline vehicle (VI60/FR1, n = 7; VI60/FR10, n = 7), 3.0 ng (VI60/FR1, n = 7; VI60/FR10, n = 6), or 6.0 ng (VI60/FR1, n = 8; VI60/FR10, n = 6). The dorsal control groups were trained on the VI60/FR10 schedule and received bilateral injections of either vehicle (n = 5) or 6.0 ng of CGS 21680 (n = 6). Effects of a functional disconnection procedure on operant responding. A third batch of rats were trained for 5 weeks on the VI60/FR10 schedule for the disconnection experiment. After postsurgical training, rats received injections of either vehicle or 24.0 ng of CGS 21680 in the accumbens, plus treatment with either vehicle or 1.25 ng of muscimol hydrochloride in the contralateral VP. Injections were counterbalanced for left and right placements. Animals were randomly assignment to one of the following four combined drug/site treatment conditions, which followed a 2 × 2 factorial design: vehicle/accumbens plus vehicle/VP (n = 6), vehicle/accumbens plus 1.25 ng of muscimol/VP (n = 7), 24.0 ng of CGS 21680/accumbens plus vehicle/VP (n = 5), and 24.0 ng of CGS 21680/accumbens plus 1.25 ng of muscimol/VP (n = 6). 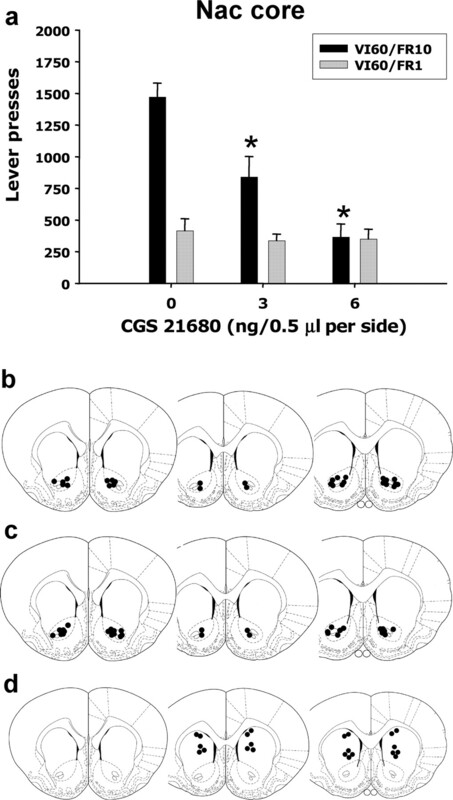 The control experiment for this study involved two groups of animals that received ipsilateral injections of drug or vehicle; the drug group received 24 ng of CGS 21680 into the accumbens combined with 1.25 ng of muscimol into the ipsilateral VP (n = 6), whereas the vehicle group (n = 5) received saline injections in both structures. For the anatomical tracing experiment, cholera-toxin B (CTB 488; Invitrogen) was injected into VP 1 week before perfusion (n = 6), to allow retrograde transport of the tracer to the accumbens. For double labeling, each antigen was detected using different chromogens. CTB was visualized using 3,3′ diaminobenzidine (DAB) (brown), and A2A receptors were visualized using Vector vasoactive intestinal peptide (V-VIP) (Vector Laboratories) (purple). When processing the tissue, the immunohistochemical protocol for CTB was conducted first, followed by the A2A receptor protocol. Brains were fixed using 3.7% formaldehyde solution and sliced with a vibratome (40 μm sections). The protocol used for CTB visualization has been described previously (Farrar et al., 2008). Endogenous peroxidase activity was blocked with a 20 min incubation in 0.5% hydrogen peroxide (H2O2) plus 1% methanol in PBS at room temperature on a shaker table. Free-floating sections were rinsed in PBS (three times for 10 min) and then permeabilized and blocked in a solution with 0.2% Triton X-100 and normal goat serum (NGS) (Vector Laboratories) for 1 h in PBS. Sections were incubated in the primary antibody rabbit anti-CTB (1:5000; Sigma-Aldrich) and NGS for 16 h at 4°C. After three PBS rinses, sections were incubated in the secondary antibody biotinylated goat anti-rabbit (1:200; Vector Laboratories) and NGS for 2 h at room temperature. Tissue was rinsed again (three times for 10 min) and incubated in a PBS, Triton X-100, avidin–biotin solution (ABC kit;Vector Laboratories) for 1 h at room temperature. After rinsing (three times for 10 min), tissue was incubated in a solution containing buffer, H2O2, and DAB (Vector Laboratories) for 2–10 min at room temperature and rinsed a final time (three times for 10 min). Some of the retrogradely labeled tissue sections were cleared in Citrosolve, mounted on slides, and coverslipped for light microscopy observations. The rest of the sections were further processed for the visualization the A2A receptors. In this case, the free-floating tissue was again exposed to a hydrogen peroxide solution for 5 min followed by a water rinse. Subsequently, tissue was mounted on plus slides and immersed in preheated low pH antigen retrieval (DakoCytomation) for 20 min. After the sections were cooled and rinsed three times in PBS, the primary antibody mouse monoclonal anti-adenosine receptor A2A (1:1000; dissolved in bovine serum albumin; Upstate) was applied and incubated overnight at 4°C. Slides were rinsed in PBS and incubated in the secondary antibody horse anti-mouse (Envision +HPR Monoclonal; DakoCytomation) for 1 h. After three rinses in PBS, the reaction was visualized with V-VIP (Vector Laboratories). The sections were allowed to air dry, cleared in Citrosolve, and coverslipped for microscopic observation. A unilateral guide cannula was implanted for the VP microdialysis, whereas an injection cannula was implanted in the ipsilateral accumbens. After recovery (7–10 d), rats were habituated to the microdialysis boxes for 2 d. On sample collection day, dialysis probes (Bioanalytical Systems) were inserted through the microdialysis guide cannulas early in the morning. Dialysis samples were collected every 30 min. Artificial CSF (in mm: 147.2 NaCl, 2.4 CaCl2, and 4.0 KCl) was continuously pumped through the probe (2.0 μl/min). The last two samples before treatment were used as baseline samples. In the last 5 min of the last baseline sample, rats received intra-accumbens injections of either vehicle (n = 6) or 24.0 ng of CGS 21680 (n = 9). Five samples were collected after injection. Samples were frozen and analyzed for GABA content using reverse-phase HPLC with electrochemical detection (ESA). The HPLC analysis of GABA content required a preinjection derivatization that was accomplished using o-phthalidialdehyde; all HPLC methods used have been described previously (Trevitt et al., 2002; Correa et al., 2003; Ishiwari et al., 2004). After behavioral testing, animals were anesthetized with CO2 and perfused intracardially with physiological saline followed by 3.7% formaldehyde. Brains were stored in formaldehyde and then cryoprotected in a 30% sucrose solution for 3 d before being sliced with a cryostat in 50 μm sections. Slices were stained with cresyl violet and examined by an observer who was unaware of the experimental treatment. Any animal with improper cannula placement or significant damage around the injection site was excluded from the analyses of behavioral data (30% of implantations were rejected). The effects of systemic CGS 21680 injections were analyzed using 2 (schedule) × 4 (dose) two-way ANOVAs, with dose as the within-subjects factor. ED50 values were estimated using nonlinear regression analysis (GraphPad Prism). The exponential dose–response function was constrained to a minimum of zero and a maximum of the vehicle mean. Behavioral effects of the bilateral intracranial injections of CGS 21680 into the nucleus accumbens were analyzed using a between-subjects 2 (schedule) × 3 (dose) two-way ANOVA. For IRT data analyses, two parameters were singled out for statistical analyses: fast responses (IRTs <1.0 s) and pauses (IRTs >20.0 s). These parameters were analyzed using a 2 (schedule) × 3 (dose) two-way ANOVA. The use of these measures was based on previous research (Sokolowski and Salamone, 1998; Correa et al., 2002; Mingote et al., 2005). Significant interactions that were indicative of treatment-specific IRT effects were further analyzed for simple effects using the error terms from the specific analyses. For the dorsal control experiment, behavioral data were analyzed using a one-way ANOVA. Behavioral data for the disconnection experiment were analyzed using between-subjects 2 (placement) × 2 (drug) factorial ANOVA. Neurochemical data for the microdialysis experiment were transformed into percentage of baseline values. The 100% value was the average of the last two samples before the intracranial injection of CGS 21680 into the accumbens. The percentage of baseline was analyzed using within-subjects 2 (treatment) × 7 (sample) two-way ANOVA and by orthogonal analysis of trend. Additional analyses of the microdialysis data were conducted by performing analysis of covariance (ANCOVA) of the postinjection data, using the last baseline sample as the covariate. This method also is a way of correcting for variability in baseline GABA levels across animals. For all ANOVA calculations, a computerized statistical package (SPSS 10.1) was used (α = 0.05). Interaction comparisons and simple main effects using the error term from individual analyses were conducted to determine the sources of interaction effects. Planned comparisons using the overall error term were used to assess the differences between each dose and the control condition, which kept the total number of comparisons to the number of conditions minus one. The first experiment studied the effects of systemic administration of the adenosine A2A agonist CGS 21680 on lever-pressing behavior in two operant schedules of reinforcement: a low-ratio-requirement schedule (VI60/FR1) and a high-ratio-requirement schedule (VI60/FR10). The interval requirement was added so that both schedules would have the same programmed density of reinforcement over time. Systemic administration of CGS 21680 (saline vehicle, 0.05, 0.1, 0.2 mg/kg), produced an overall significant drug effect on both schedules of reinforcement (Fig. 1a). Nevertheless, it was evident that the VI60/FR10 schedule was much more sensitive to the effects of CGS 21680 than the VI60/FR1 schedule. There was a significant dose × schedule interaction (F(3,54) = 25.725; p < 0.001), and the ED50 (i.e., the dose that produced half-maximal responding) was lower for the VI60/FR10 schedule than for the VI60/FR1 schedule (Fig. 1b). Effects of systemic injections of CGS 21680 on two interval operant schedules with different ratio requirements attached: VI60/FR1 and VI60/FR10. a, Suppressant effects of different doses of CGS 21680 on lever-pressing behavior. *p < 0.05, VI60/FR10, different from vehicle; +p < 0.05, VI60/FR1, different from vehicle. b, ED50 analysis also showed significantly higher sensitivity to the effect of CGS 21680 on VI60/FR10 compared with VI60/FR1. The ED50 value for VI60/FR10 was 0.06 mg/kg, and the ED50 value for VI60/FR1 was 0.1 mg/kg. These two values for the different schedules were significantly different, i.e., the 95% confidence intervals (CI) for both schedules did not overlap (confidence interval for VI60/FR10, 0.05–0.07 mg/kg; confidence interval for VI60/FR1, 0.08–0.14 mg/kg). These schedule differences were much more apparent after intracranial injections of CGS 21680 directly into nucleus accumbens (Fig. 2a). In experiment 2, there was a robust schedule × dose interaction (F(2,35) = 13.5; p < 0.001). Furthermore, there was a significant main effect of CGS 21680 treatment among those rats performing on the VI60/FR10 schedule (F(1,16) = 19.833; p < 0.001) but no effect for the rats performing on the VI60/FR1 schedule. A factorial ANCOVA with baseline response rate as the covariant was also performed to determine whether the dose × schedule interaction was an artifact of different baseline response rates. As expected, this ANCOVA eliminated the overall differences between schedules, but there was still a significant overall effect of dose (F(2,34) = 22.727; p < 0.001) and a significant dose × schedule interaction (F(2,34) = 15.721; p < 0.001). This indicated that the interaction was not simply an artifact of different baseline rates of responding on the two schedules and demonstrated that local stimulation of accumbens adenosine A2A receptors had a preferential effect on the VI schedule with the added ratio requirement (i.e., VI60/FR10). 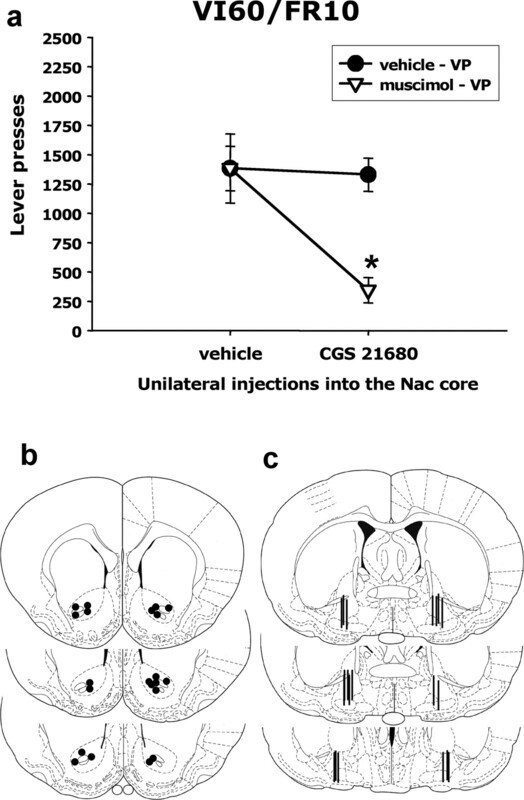 These effects of intra-accumbens CGS 21680 were site specific, because injections into a control site dorsal to the nucleus accumbens had no significant effect (mean ± SEM number of responses were as follows: vehicle, 1533.0 ± 195.6; 6.0 ng of CGS 21680, 1683.5 ± 190.4). Effects of local intra-accumbens injections of CGS 21680 on lever pressing on two variable interval schedules with different ratio requirements. a, Stimulation of A2A receptors in the accumbens had no effect on VI60/FR1 performance but induced a substantial decrease in responding in variable interval schedule with the higher ratio requirement attached (*p < 0.05, VI60/FR10, different from vehicle). 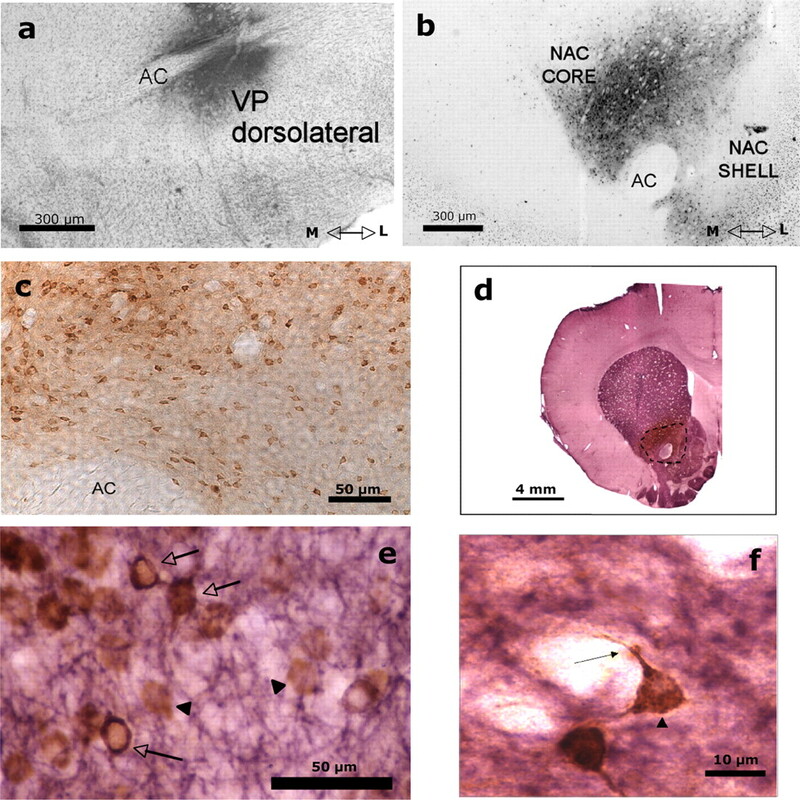 b, c, Cannula placements from intracranial injections in animals trained in the VI60/FR10 and the VI60/FR1 schedules, respectively, were localized in the nucleus accumbens (Nac) core. d, Cannulas placements for the dorsal control site. c, d, Modified from Paxinos and Watson (1997), their Figures 11–13. The effects of CGS 21680 were further characterized by detailed analyses of the IRTs. Several previous studies reported that attaching a ratio requirement to a schedule presents a challenge to the animal, and rats adapt to this obstacle by increasing responses rates and showing a characteristic “bursting” pattern of responses (Sokolowski and Salamone, 1998; Salamone et al., 1999; Correa et al., 2002; Mingote et al., 2005). The present study showed that vehicle-injected animals on the VI60/FR10 schedule emitted more responses than those on the VI60/FR1 schedule, and this difference was marked by a higher number of fast responses (IRTs <1 s) (Fig. 3a) in rats responding on the FR10 task. Intra-accumbens injections of CGS 21680 suppressed the tendency to emit a high number of fast responses, and this effect was the principal cause for the substantial reduction of responding on the VI60/FR10 schedule (F(2,16) = 17.514; p < 0.001). Thus, CGS 21680 injected into the accumbens is particularly disruptive of tasks that demand higher work output and are characterized by high local rates of responding. Nevertheless, the schedule with a low work requirement (VI60/FR1) was not totally insensitive to neurochemical manipulations, because accumbens A2A receptor stimulation increased the tendency to take long pauses in responding in both schedules (Fig. 3b) (overall dose effect, F(2,35) = 4.004; p < 0.05). Although the number of pauses was affected in both schedules, rats performing on a VI60/FR10 schedule spent more time not responding. Drug-treated rats performing on the schedule with the higher work requirement took a longer time to reinitiate responding after taking a pause compared with rats performing on the low-work-requirement task (Fig. 3c) (F(2,35) = 4.004; p < 0.05). Effects of intra-accumbens injections of CGS 21680 on IRTs collected while animals were performing in two different interval schedules. a, CGS 21680 injections had a dramatic dose-dependent suppressant effect of the number of fast responses (IRTs <1 s) emitted on the VI60/FR10 schedule (*p < 0.05, VI60/FR10, different from vehicle). b, Effects of CGS 21680 on the number of pauses (IRTs >20.0 s) were independent of ratio requirement of the instrumental task (#p < 0.05, overall effect of CGS 21680 on pause number). c, Analysis of the total pause time revealed that for the highest dose (6.0 ng) the rats performing on the VI60/FR10 are pausing for longer time compared with the rats performing on the VI60/FR1 schedule (*p < 0.05, significant difference between schedules). Overt signs of sedation were sometimes seen by experimenters when they placed animals in and out of the operant chambers. In the systemic injection experiment, it was noted that 0.1 and 0.2 mg/kg CGS 21680 injected intraperitoneally generally produced observable signs of sedation/drowsiness (head down, eyes partially closed, flattened posture). In contrast, intra-accumbens injections did not produce this effect. Furthermore, drug-treated animals in each experiment consumed all the operant pellets presented. Additional experiments investigated the effects of stimulating accumbens adenosine A2A receptors on the VP, which is the main target of accumbens neurons. Track-tracing techniques combined with immunohistochemical methods confirmed that nucleus accumbens cells that project to VP contain adenosine A2A receptor immunoreactivity. Injections of the retrograde label CTB were mostly restricted to the dorsomedial or dorsolateral compartments of VP, and the CTB-labeled cell bodies were mostly found in accumbens core (Fig. 4a–c). In addition, these retrogradely labeled neurons also expressed adenosine A2A receptor immunoreactivity (Fig. 4d–f). These accumbens projection neurons are GABAergic, and therefore we investigated the effect of stimulation of accumbens A2A receptors on GABA release in the VP. We measured extracellular GABA levels in VP before and after intra-accumbens injections of CGS 21680 using microdialysis methods (Fig. 5a). Intracranial injections of 24.0 ng of CGS 21680 significantly increased extracellular GABA levels in the VP. Analyses across all seven samples showed a significant drug treatment effect (F(1,13) = 5.25; p < 0.05) and a significant sample × treatment interaction (F(6,78) = 2.4; p < 0.05). Analysis of simple effects demonstrated that the group that received CGS 21680 showed significantly higher levels of extracellular GABA during each of the five samples after injection compared with the group that received vehicle injections. Furthermore, orthogonal analysis of trend across all seven samples for the percentage baseline data showed a significant sample × treatment interaction for the quadratic trend (F(1,13) = 5.00; p < 0.05), indicating that VP GABA levels in the CGS 21680-treated group showed an increase followed by a decrease, whereas GABA levels for the vehicle group did not. Additional analyses of raw GABA concentration levels (data not shown), using an ANCOVA with the last sample before injection as the covariant, also showed a significant effect of treatment (F(1,12) = 5.08; p < 0.05). Retrogradely labeled accumbens–VP neurons show A2A receptor immunoreactivity. a, Coronal section showing the injection site of the retrograde tracer CTB in VP. Cells were counterstained with cresyl violet to enhance visualization. b, Coronal section showing the retrogradely labeled neurons in the nucleus accumbens (Nac) core after the injection of the CTB into the VP. c, Photomicrograph (20×) taken from one section of the accumbens core showing retrogradely labeled cells. Transported CTB is labeled brown with DAB. d, Coronal section showing the immunoreactivity of the A2A receptors (purple) in the striatal complex, which includes the neostriatum, nucleus accumbens, and olfactory tubercles. The dashed line delineates the dark brown area of the retrogradely labeled cells in the core region of the nucleus accumbens. e, Photomicrograph (40×) taken from one section of the accumbens core processed for dual labeling of CTB and A2A immunoreactivity. A brown reaction product (DAB) identified the neurons retrogradely labeled with CTB (black triangles). A2A-immunoreactive neurons were labeled purple with V-VIP, and double-labeled cells are indicated in the figure with arrows. f, High magnification (100×) showing a cell in the accumbens double labeled with CTB (brown labeling), which was mainly localized in the neuronal soma (black triangle), and A2A receptor (purple labeling), which was mainly localized in dendrites (arrow). AC, Anterior commissure; M, medial; L, lateral. Accumbens injections of CGS 21680 increase extracellular GABA in the VP. a, Percentage of baseline GABA levels in the VP before and after the injection of vehicle saline of CGS 21680 (24.0 ng, 0.5 μl/side) into the nucleus accumbens (Nac) core. The last two baseline samples collected before the injection were used to compute the percentage of baseline GABA levels. *p < 0.05, significantly different from vehicle. Preinjection baseline levels of GABA in the two groups did not differ (vehicle, 0.21 ± 0.032 ng; CGS 21680, 0.15 ± 0.020 ng; t = 1.7; df = 13; NS). By the second sample after injection, raw GABA levels in the two groups were as follows: vehicle, 0.16 ± 0.019 ng; CGS 21680, 0.21 ± 0.043 ng. b, Schematic of the intra-accumbens injections of CGS 21680 or vehicle saline into the nucleus accumbens core and the simultaneous collection of GABA samples in ipsilateral ventral pallidum using microdialysis probe. c, Cannula placements into the accumbens core (modified from Paxinos and Watson, 1996, their Figs. 11–13). d, Microdialysis probe placements into the VP (modified from Paxinos and Watson, 1996, their Figs. 18–21). Increases in GABA transmission induced by the stimulation of accumbens A2A receptors could indicate that accumbens A2A receptors and VP GABA are part of a common neural circuitry mediating effort-related functions. To address this question, the final experiment used disconnection methods to assess the possible functional relationship between accumbens A2A and VP GABA receptor stimulation. This experiment involved unilateral injections of CGS 21680 or vehicle into the accumbens core and contralateral injections of the GABAA receptor agonist muscimol or vehicle into VP. Immediately after intracranial injections, animals were put in test chambers and tested on the high ratio task (VI60/FR10). We hypothesized that there would be a substantial behavioral effect only when CGS 21680 was injected into the nucleus accumbens core and muscimol was injected into the contralateral VP, but not when there were unilateral injections of either drug. Factorial ANOVA revealed a significant placement × drug interaction (F(3,19) = 7.34; p < 0.01), and planned comparisons revealed that only the group that received combined contralateral drug injections (i.e., CGS 21680 in the accumbens/muscimol in the contralateral VP) significantly differed from the vehicle/vehicle control group (Fig. 6a). This demonstrated that combined administration of CGS 21680 in the accumbens on one side of the brain plus muscimol into the VP on the other side resulted in a synergistic suppression of operant responding compared with separate unilateral injections of each drug. The present results were not simply a consequence of the total amount of drug injected, because combined ipsilateral injections of CGS 2168 into the accumbens and muscimol into VP had no significant effect on operant responding (mean ± SEM number of responses were as follows: vehicle plus ipsilateral vehicle, 1394.0 ± 129.0; 24.0 ng of CGS 21680 plus ipsilateral VP muscimol, 1167.0 ± 160.1). Number of lever presses emitted by animals in the disconnection experiment. a, Only animals injected with CGS 21680 into the nucleus accumbens (Nac) and muscimol into the contralateral VP showed decreased lever pressing. *p < 0.05, significantly different from vehicle/vehicle group. b, Cannulas placements in the accumbens core for the animals that were in the CGS 21680/muscimol contralateral injection group (modified from Paxinos and Watson, 1996, their Figs. 11–13). c, Cannula placements in the ventral pallidum for the animals that were in the CGS 21680/muscimol contralateral injection group (modified from Paxinos and Watson, 1996, their Figs. 19–21). Placements were in the posterior/lateral zone of the VP (placement target was based on Farrar et al., 2008; specific VP subregions were not targeted). Motivated behavior often is characterized by vigor, persistence, and high levels of work output (Salamone et al., 2007). The work requirements of an instrumental task can be manipulated in several ways, including increases in the number of lever presses (i.e., the ratio) required for reinforcement. Using operant schedules with different ratio requirements, it was demonstrated that higher work requirements make animals more sensitive to the effects of the adenosine A2A receptor agonist CGS 21680. Together with the results of anatomical and neurochemical studies, the present behavioral experiments indicate that adenosine A2A receptors located on accumbens neurons projecting to the VP play an important role in behavioral activation and regulate the tendency of organisms to overcome response costs that separate them from reinforcement. Local stimulation of accumbens adenosine A2A receptors had a selective effect on the behavioral task with the higher ratio requirement, which supports the hypothesis that stimulation of accumbens adenosine A2A receptors would lead to effects similar to those produced by accumbens DA depletions. Stimulation of accumbens adenosine A2A receptors decreased total responses and fast responses on the high ratio schedule, and increased fragmentation in the response pattern (i.e., increased pausing) on both schedules, which also has been shown to occur after accumbens DA depletions (Mingote et al., 2005). This increased response fragmentation may indicate problems initiating instrumental activity, a lack of task engagement, or difficulty in responding to temporally unpredictable stimuli (Mingote et al., 2005; Corbit et al., 2007; Nicola, 2007; Salamone et al., 2007). Nevertheless, the fact that intra-accumbens CGS 21680 did not produce an overall impairment of VI60/FR1 performance indicates that two important components of instrumental behavior were left intact: (1) animals were still capable of performing food-reinforced behavior, and (2) the interval requirement of the schedule (i.e., the intermittence) in itself did not appear to be a significant factor in making animals sensitive to adenosine A2A receptor manipulations. Clearly, the ratio requirement of a task is a critical factor in determining sensitivity to the effects of nucleus accumbens adenosine A2A receptor stimulation. These results are consistent with studies involving accumbens DA depletions or antagonism (Cousins et al., 1996; Sokolowski and Salamone, 1998; Salamone et al., 1999; Wakabayashi et al., 2004; Mingote et al., 2005; Winstanley et al., 2005; Floresco et al., 2008). Although systemic injections of CGS 21680 also produced a preferential effect on the schedule with the larger ratio requirement, at the higher doses used (0.1 and 0.2 mg/kg), intraperitoneal injections of CGS 21680 suppressed responding on both schedules. These results are likely to be related to sedative effects (i.e., sleepiness/drowsiness, torpor, head down, eyes partially closed) that are known to be induced by 0.1 and 0.2 mg/kg doses of CGS 21680 (Font et al., 2008; Mingote et al., 2008). This suggestion is consistent with the extensive literature showing that adenosine is involved in sleep and that several brain areas, including basal forebrain and the ventrolateral preoptic area, are involved in the sedative functions of adenosine (Porkka-Heiskanen et al., 2000; Stenberg, 2007). Intra-accumbens injections of CGS 21680 appear to have avoided actions on brain areas related to sedation and induced effects that were clearly different for both schedules. Consistent with this idea, Font et al. (2008) recently reported that systemic injections of 0.1 and 0.2 mg/kg CGS 21680 induced observable signs of sedation/drowsiness in all rats, whereas injections of 24.0 ng of CGS 21680 into nucleus accumbens did not produce overt sedation/drowsiness in any animals. The behavioral effects produced by CGS 21680 in the present study were relatively specific to nucleus accumbens, because injections of the higher dose into the overlying dorsal striatum had no effect on operant responding. This finding is consistent with previous studies showing that DA depletions or injections of CGS 21680 dorsal to nucleus accumbens did not impair FR5 operant responding (Cousins et al. 1993; Font et al., 2008). Together, the anatomical, neurochemical, and behavioral studies indicated that the behavioral effects of CGS 21680 are in part attributable to stimulation of adenosine A2A receptors on GABAergic accumbens neurons that project to VP. Nucleus accumbens core neurons are known to project to VP (Usuda et al., 1998; Zhou et al., 2004), and a recent study showed that the specific VP target area used in the present experiments receives a projection from accumbens core (Farrar et al., 2008). The present studies showed that, after an injection of the retrograde tracer CTB into VP target area, the CTB-labeled cell bodies were mostly found in accumbens core (Fig. 4a–c) and also that these retrogradely labeled accumbens core–VP neurons coexpressed adenosine A2A receptor immunoreactivity (Fig. 4d–f). Thus, the present studies directly demonstrated that accumbens core–VP projection neurons that form part of the ventral striatopallidal pathway also contain adenosine A2A receptor immunoreactivity. This finding supports the circuitry model offered by Ferré (1997), who suggested that accumbens neurons projecting to the VP contain A2A receptors and also is consistent with the report that Fos-like immunoreactivity induced by CGS 21860 can be observed in accumbens cells that are labeled by fluoro-gold injected into VP (Robertson and Jian, 1995). Intra-accumbens infusions of a behaviorally active dose of CGS 21680 (24.0 ng) increased extracellular GABA levels in the VP as measured by microdialysis (Fig. 5). Previous work indicated that local administration of 50 ng of CGS 21680 into the neostriatum increased extracellular GABA levels in the globus pallidus (Ochi et al., 2000). 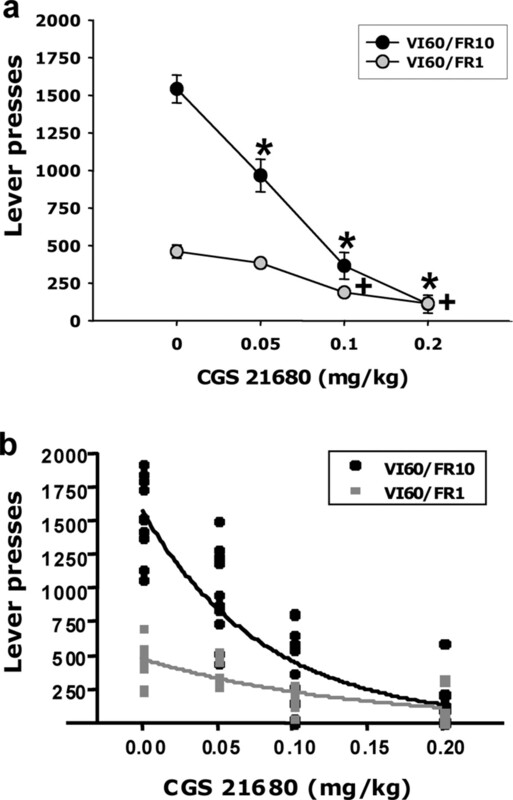 Moreover, coinfusion of the DA D2 receptor agonist quinpirole along with CGS 21680, through a microdialysis probe implanted in the accumbens, blocked the increase in VP GABA levels induced by CGS 121680 alone (Díaz-Cabiale et al., 2002). These findings are consistent with reports showing that accumbens adenosine A2A receptors are colocalized with D2 receptors in GABAergic enkephalin-positive cells (Svenningsson et al., 1999) and further support the hypothesis that DA D2 receptors and adenosine A2A receptors have opposite effects on accumbens neuron activity (Fredholm and Svenningsson, 2003). The cellular mechanisms underlying the effects of A2A receptor stimulation may involve increased cAMP production attributable to the activation of postsynaptic adenosine A2A receptors (Svenningsson et al., 1999; Schiffmann et al., 2007) and a consequent increase in spiny neuron excitability (Colwell and Levine, 1995). Another possibility is presynaptic or postsynaptic mechanisms that involve heterodimerization with D2 receptors (Schiffmann et al., 2007; Ferré, 2008). A2A receptors are located on glutamate terminals in striatum, and local injections of CGS 21680 have been shown to increase striatal glutamate release (Schiffmann et al., 2007; Ferré, 2008). Nevertheless, regardless of the particular combination of mechanisms that is involved, it appears that the net effect of activating accumbens adenosine A2A receptors is to increase GABA transmission in VP. VP injections of the GABAA agonist muscimol can decrease novelty-induced motor activity and alter effort-related choice behavior (Hooks and Kalivas, 1995; Farrar et al., 2008). These behavioral effects are similar to those produced by accumbens DA depletions or antagonism (Nowend et al., 2001; Correa et al., 2002; Farrar et al., 2008). Such results, together with the present data, suggest that VP GABA transmission is involved in mediating some of the behavioral effects of DA and adenosine manipulations in nucleus accumbens. The final experiment clearly showed that VI60/FR10 performance was disrupted after unilateral intra-accumbens injections of CGS 21680 combined with injections of the GABAA agonist muscimol into the contralateral VP. Separate unilateral injections of each drug, and combined ipsilateral injections of both drugs, were ineffective. This type of disconnection methodology has been useful for studying how distinct brain areas or systems are part of an interconnected functional circuitry (Christakou et al., 2004; Floresco and Ghods-Sharifi, 2007). Thus, the results of the present experiments indicate that nucleus accumbens and VP are part of a common neural circuitry regulating response output in instrumental tasks with high work requirements. Currently, considerable emphasis is being placed on the neuronal mechanisms underlying effort-related processes. Effort-related dysfunctions such as psychomotor slowing or anergia have been reported to be a central feature of depression (Stahl, 2002; Salamone et al., 2006). Nucleus accumbens and VP appear to be part of a larger forebrain circuit regulating behavioral activation and effort-related choice, which includes the prefrontal/anterior cingulate cortex and the amygdala (Hooks and Kalivas, 1995; Cousins et al., 1996; Sokolowski and Salamone, 1998; Nowend et al., 2001; Walton et al., 2003; Denk et al., 2005; Schweimer et al., 2005; Salamone et al., 2006, 2007; Floresco and Ghods-Sharifi, 2007; Farrar et al., 2007, 2008). The present results implicate accumbens adenosine A2A receptors as an additional mechanism through which this larger forebrain circuit can be regulated. Activation of these receptors affected extracellular GABA in the VP, and this stimulation of GABAergic activity in VP appears to be a factor influencing behavioral output. Future research should determine whether local blockade of VP GABAA receptors attenuates the behavioral effects of stimulation of accumbens adenosine A2A receptors and should investigate the effects of adenosine A2A receptor knock-outs (Shen et al., 2008). Additional assessments of this circuitry should involve disconnection studies that include dopaminergic manipulations of nucleus accumbens and conditions that affect the amygdala and prefrontal cortex, as well as treatments related to adenosine and GABA. This research was supported by National Institutes of Health/National Institute of Mental Health Grant MH078023 (J.D.S.). L.F. was supported by a grant from Fundació Caixa Castelló-Bancaixa (Spain). (1999) Nucleus accumbens dopamine depletions make rats more sensitive to high ratio requirements but do not impair primary food reinforcement. Neuroscience 92:545–552. (2007) Opioids for hedonic experience and dopamine to get ready for it. Psychopharmacology (Berl) 191:497–506. (2004) Prefrontal cortical-ventral striatal interactions involved in affective modulation of attentional performance: implications for corticostriatal circuit function. J Neurosci 24:773–780. (2007) General and outcome-specific forms of Pavlovian-instrumental transfer: the effect of shifts in motivational state and inactivation of the ventral tegmental area. Eur J Neurosci 26:3141–3149. (2002) Nucleus accumbens dopamine and work requirements on interval schedules. Behav Brain Res 137:179–187. (2003) Substantia nigra pars reticulata GABA is involved in the regulation of operant lever pressing: pharmacological and microdialysis studies. Neuroscience 119:759–766. (2004) The adenosine A2A antagonist KF17837 reverses the locomotor suppression and tremulous jaw movements induced by haloperidol in rats: possible relevance to parkinsonism. Behav Brain Res 148:47–54. (1993) Different effects of nucleus accumbens and ventrolateral striatal dopamine depletions on instrumental response selection in the rat. Pharmacol Biochem Behav 46:943–951. (1996) Nucleus accumbens dopamine depletions alter relative response allocation in a T-maze cost/benefit task. Behav Brain Res 74:189–197. (1996) Evidence for high-affinity binding sites for the adenosine A2A receptor agonist [3H]CGS 21680 in the rat hippocampus and cerebral cortex that are different from striatal A2A receptors. Naunyn Schmiedebergs Arch Pharmacol 353:261–271. (2005) Differential involvement of serotonin and dopamine systems in cost-benefit decisions about delay or effort. Psychopharmacology (Berl) 179:587–596. (2002) Metabotropic glutamate mGlu5 receptor-mediated modulation of the ventral striopallidal GABA pathway in rats. Interactions with adenosine A(2A) and dopamine D(2) receptors. Neurosci Lett 324:154–158. (2007) Adenosine A(2A) receptor antagonism reverses the effects of dopamine receptor antagonism on instrumental output and effort-related choice in the rat: implications for studies of psychomotor slowing. Psychopharmacology (Berl) 191:579–586. (2008) Forebrain circuitry involved in effort-related choice: injections of the GABA(A) agonist muscimol into ventral pallidum alter response allocation in food-seeking behavior. Neuroscience 152:321–330. (1997) Adenosine-dopamine interactions in the ventral striatum. Implications for the treatment of schizophrenia. Psychopharmacology 133:107–120. (2008) An update on the mechanisms of the psychostimulant effects of caffeine. J Neurochem 105:1067–1079. (2007) Amygdala-prefrontal cortical circuitry regulates effort-based decision making. Cereb Cortex 17:251–260. (2008) Dopaminergic and glutamatergic regulation of effort- and delay-based decision making. Neuropsychopharmacology 33:1966–1979. (2008) Intra-accumbens injections of the adenosine A(2A) agonist CGS 21680 affect effort-related choice behavior in rats. Psychopharmacology 199:515–526. (2003) Adenosine-dopamine interactions: development of a concept and some comments on therapeutic possibilities. Neurology 61:S5–S9. (2007) Adenosine A(2A) receptors, dopamine D(2) receptors and their interactions in Parkinson's disease. Mov Disord 22:1990–2017. (2004) Binding of adenosine receptor ligands to brain of adenosine receptor knock-out mice: evidence that CGS 21680 binds to A1 receptors in hippocampus. Naunyn Schmiedebergs Arch Pharmacol 70:270–278. (1997) Motor depressant effects mediated by dopamine D2 and adenosine A2A receptors in the nucleus accumbens and the caudate-putamen. Eur J Pharmacol 323:127–131. (2001) Ultrastructural localization of adenosine A2A receptors suggests multiple cellular sites for modulation of GABAergic neurons in rat striatum. J Comp Neurol 431:331–346. (1995) The role of mesoaccumbens–pallidal circuitry in novelty-induced behavioral activation. Neuroscience 64:587–597. (1996) Dissociations between appetitive and consummatory responses by pharmacological manipulations of reward-relevant brain regions. Behav Neurosci 110:331–345. (2004) The GABA uptake inhibitor beta-alanine reduces pilocarpine-induced tremor and increases extracellular GABA in substantia nigra pars reticulata as measured by microdialysis. J Neurosci Methods 140:39–46. (2007) Injections of the selective adenosine A2A antagonist MSX-3 into the nucleus accumbens core attenuate the locomotor suppression induced by haloperidol in rats. Behav Brain Res 178:190–199. (1989) [3H]CGS 21680, a selective A2 adenosine receptor agonist directly labels A2 receptors in rat brain. J Pharmacol Exp Ther 251:888–893. (2000) Functional aspects of the ventral pallidum. Amino Acids 19:201–210. (2005) Ratio and time requirements on operant schedules: effort-related effects of nucleus accumbens dopamine depletions. Eur J Neurosci 21:1749–1757. (2008) Systemic administration of the adenosine A(2A) agonist CGS 21680 induces sedation at doses that suppress lever pressing and food intake. Pharmacol Biochem Behav 89:345–351. (2007) Role of adenosine A2A receptors in parkinsonian motor impairment and l-DOPA-induced motor complications. Prog Neurobiol 83:293–309. (2007) The nucleus accumbens as part of a basal ganglia action selection circuit. Psychopharmacology 191:521–550. (2001) D1 or D2 antagonism in nucleus accumbens core or dorsomedial shell suppresses lever pressing for food but leads to compensatory increases in chow consumption. Pharmacol Biochem Behav 69:373–382. (2000) Systemic administration of adenosine A(2A) receptor antagonist reverses increased GABA release in the globus pallidus of unilateral 6-hydroxydopamine-lesioned rats: a microdialysis study. Neuroscience 100:53–62. (1997) The rat brain in stereotaxic coordinates (Academic, New York). (2000) Brain site-specificity of extracellular adenosine concentration changes during sleep deprivation and spontaneous sleep: an in vivo microdialysis study. Neuroscience 99:507–517. (1995) D1 and D2 dopamine receptors differentially increase Fos-like immunoreactivity in accumbal projections to the ventral pallidum and midbrain. Neuroscience 64:1019–1034. (1998) Immunohistochemical localization of adenosine A2A receptors in the rat central nervous system. J Comp Neurol 401:163–186. (2002) Motivational views of reinforcement: implications for understanding the behavioral functions of nucleus accumbens dopamine. Behav Brain Res 137:3–25. (1991) Haloperidol and nucleus accumbens dopamine depletion suppress lever pressing for food but increase free food consumption in a novel food choice procedure. Psychopharmacology (Berl) 104:515–521. (1999) Nucleus accumbens dopamine and rate responding: neurochemical and behavioral studies. Psycholobiology 2:236–247. (2001) Nucleus accumbens dopamine depletions make animals highly sensitive to high fixed ratio requirements but do not impair primary food reinforcement. Neuroscience 105:863–870. (2002) Dopamine antagonists alter response allocation but do not suppress appetite for food in rats: contrast between the effects of SKF 83566, raclopride, and fenfluramine on a concurrent choice task. Psychopharmacology (Berl) 160:371–380. (2005) Beyond the reward hypothesis: alternative functions of nucleus accumbens dopamine. Curr Opin Pharmacol 5:34–41. (2006) Nucleus accumbens dopamine and the forebrain circuitry involved in behavioral activation and effort-related decision making: implications for understanding anergia and psychomotor slowing in depression. Curr Psychiat Rev 2:267–280. (2008) Tremorolytic effects of adenosine A2A antagonists: implications for parkinsonism. Front Biosci 13:3594–3605. (2007) Adenosine A2A receptors and basal ganglia physiology. Prog Neurobiol 83:277–292. (2005) Involvement of catecholamine neurotransmission in the rat anterior cingulate in effort-related decision making. Behav Neurosci 119:1687–1692. (2008) A critical role of the adenosine A2A receptor in extrastriatal neurons in modulating psychomotor activity as revealed by opposite phenotypes of striatum and forebrain A2A receptor knock-outs. J Neurosci 28:2970–2975. (1998) The role of accumbens dopamine in lever pressing and response allocation: effects of 6-OHDA injected into core and dorsomedial shell. Pharmacol Biochem Behav 59:557–566. (2002) The psychopharmacology of energy and fatigue. J Clin Psychiatry 63:7–8. (2007) Neuroanatomy and neurochemistry of sleep. Cell Mol Life Sci 64:1187–1204. (2006) in Microcircuits, the interface between neurons and global function, Microcircuits in the striatum: cells types, intrinsic membrane properties, and neuromodulation, eds Grillner S, Grabiel AM (MIT, Cambridge, MA). (2004) Ventral pallidal representation of pavlovian cues and reward: population and rate codes. J Neurosci 24:1058–1069. (2002) Interactions between dopamine D1 receptors and GABA mechanisms in substantia nigra pars reticulata: neurochemical and behavioral studies. Psychopharmacology 159:229–237. (1998) Efferent projections of the nucleus accumbens in the rat with special reference to subdivision of the nucleus: biotinylated dextran amine study. Brain Res 797:73–93. (2004) Dissociation of the role of nucleus accumbens dopamine in responding to reward-predictive cues and waiting for reward. Behav Brain Res 154:19–30. (2003) Functional specialization within medial frontal cortex of the anterior cingulate for evaluating effort-related decisions. J Neurosci 23:6475–6479. (2003) Influence of CGS 21680, a selective adenosine A(2A) agonist, on the phencyclidine-induced sensorimotor gating deficit and motor behaviour in rats. Psychopharmacology (Berl) 168:299–306. (2005) Interactions between serotonin and dopamine in the control of impulsive choice in rats: therapeutic implications for impulse control disorders. Neuropsychopharmacology 30:669–682. (2004) Neurokinin B-producing projection neurons in the lateral stripe of the striatum and cell clusters of the accumbens nucleus in the rat. J Comp Neurol 480:143–161.